I have to be honest, I’ve never had pineapple upside down cake. And I’ve certainly never had pineapple upside down bread (do they even make that?). But I will say, perfectly made sweet breads are one of my greatest downfalls. You put me near a loaf of banana bread or pumpkin bread and you better not expect to have any yourself. Especially if there is any form of chocolate in the batter…you have no fighting chance. That being said, I was determined to come up with a guilt-free recipe for one of my favorite treats. When I came home from the farmers market with more apples than I knew what to do with (seriously, 17 apples for $2.00!) it seemed like a perfect opportunity to take on the challenge. After a few failed attempts (and several peeled apples later!) this perfectly moist, tender loaf chock full of nutrients and just a touch of sweetness was born. Since this bread is mostly carbohydrates, enjoy it as dessert after a meal rich in protein and a little fat or have it for breakfast with a side of yogurt or scrambled eggs to keep your blood sugar stable. 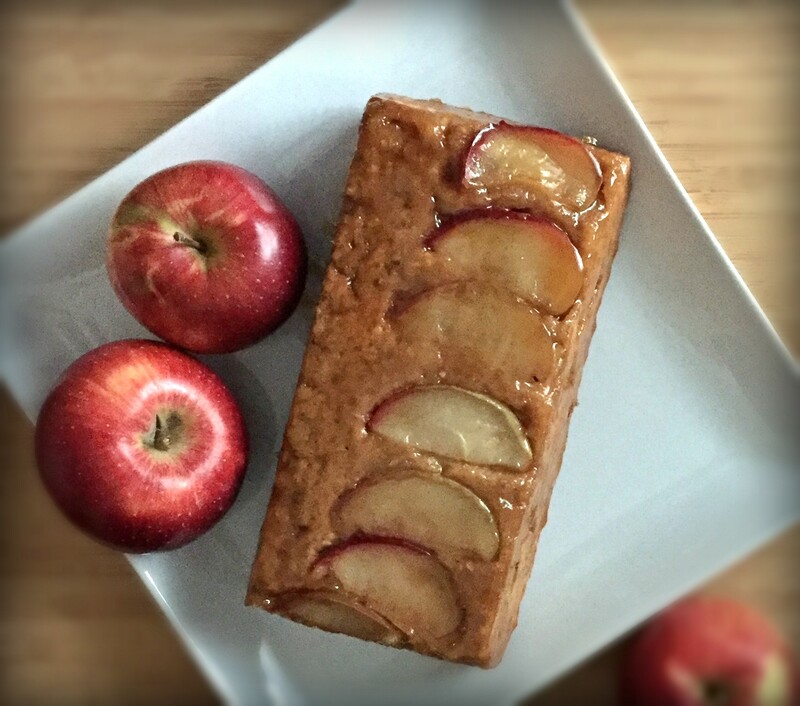 If you’re simply enjoying it as a treat, enjoy a slice anytime you’d like a healthy splurge! Preheat oven to 350ºF. Lightly grease a 9×5″ loaf pan with cooking spray and set aside. Using an apple cutter, core the apple and cut it into 8 slices. Cut 4 of the slices in 1/2 to form 8 thin slices. These slices will be placed on the bottom of the loaf pan to form the “upside down” look. Leave the peel on these slices for appearance. Peel the other 4 slices of the apple and finely chop into small pieces. These will be added to the batter. Toss apple slices and chopped apples in lemon juice and set aside. In a medium bowl, combine flour, oats, baking powder, baking soda, salt, cinnamon, and allspice. In a large bowl, add 1/3 cup brown sugar, egg, egg whites, vanilla, applesauce, and oil. Whisk wet ingredients together until fully combined. Add chopped apples and stir until just mixed through. Make caramel by adding butter and 2 tbsp brown sugar to a small saucepan over medium-high heat. Stir continuously until butter is melted. Remove from heat and pour into bottom of loaf pan. Add 8 thin apple slices in a straight line on top of caramel. Then pour batter on top. Use a spatula or butter knife to make sure the batter is completely smooth on top so you can invert the loaf when it’s done baking. Bake in the oven for 40 minutes. Remove from the oven and invert on a large plate. Allow to cool then slice into 16 servings.